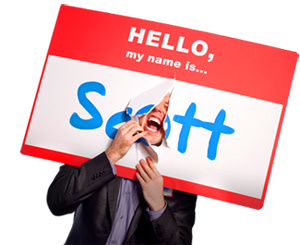 Smile and They Will See You - HELLO, my name is Scott! 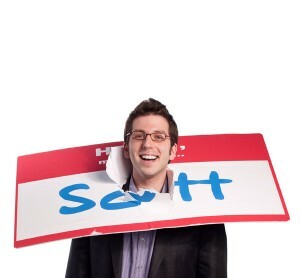 I used to address the issue of smiling in my talks. Then I realized how overdone the subject was. Not that smiling wasn’t important. After all, it’s the #1 symbol of approachability in the world! Smile when you answer the phone! Smile for three seconds when you enter a room! OK. We get it! Smiling is important. Thanks. But the other day I had a thought. After my speech, I was bumming around New Haven, waiting for my cab to pick me up. To kill time I walked into this cool looking coffee shop on Orange Avenue. Electronic Indian music blasted from the speakers. A few customers milled about. But for the most part the place was empty. I approached the counter. Saw the barista across the room, working on his laptop. Of course, I didn’t say any such thing. That’s not how I roll. I like to think I have a little more patience than that! No words. No flailing arms. Just a big fat, friendly grin. Directed right at the Barista. Sure enough, he looked up from his laptop. Sure enough, he offered a friendly smile right back at me. And sure enough, he walked over to my side of the counter and took my order. Because if you smile, they will see you. I’ve been practicing this technique (gosh, do I even have to call it a technique?) for a long time. 1. You smile and patiently wait. 2. Positive energy is sent to the other person. 4. They look up to meet your gaze. 7. You get (or give) better, more approachable service. Smile and they will see you.